16.5″ Bill Lucchini model Viola. Contact Seth Manesse at 435-557-0096. Viola by A. Glodek for sale. 16″, very playable size with a dark C-string sound and great projection. Contact Tara Hoellein at tarahoellein(Replace this parenthesis with the @ sign)gmail.com. 1954 16.5″ viola made by Michele de Luccia, Salerno, Italy. The top is made of two pieces of even medium wide grain spruce. The back is made of two pieces of maple with a handsome curl running horizontal to the center seam. The wood of the scroll and the ribs matches the wood of the back. The chamfer of the scroll and the edges of the rib are varnished black. The varnish is made of oil and of light orange-brown color applied over a yellow-brown ground. 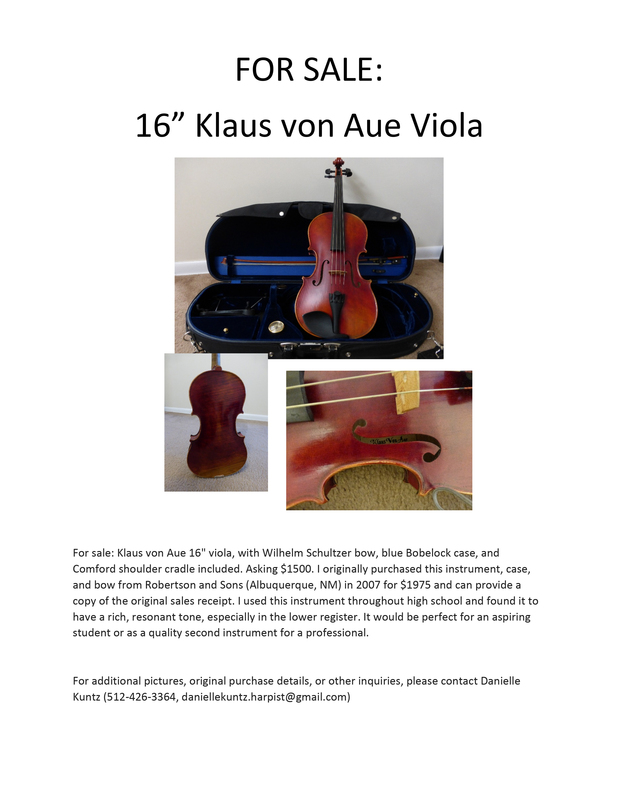 This viola is easy to play and has comfortable upper bouts and neck width. The sound is warm and even, and responds quickly. It is located in Salt Lake City, UT, and was owned by the former Director of Orchestra Personnel of the Utah Symphony, Eric Johnson.